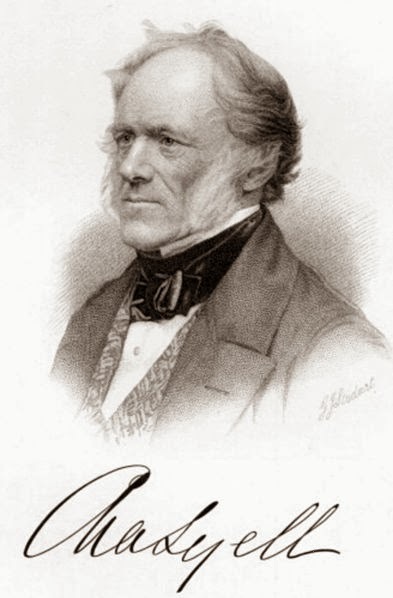 Charles Lyell (1797–1875). Scientific Papers. We wonder if the man who worried about the "scientifical" prediction that "The sun's heat will give out in ten million years more," had read Lyell on the gradual changes in the earth's surface. Supposed Alternate Periods of Repose and Disorder—Observed Facts in which this Doctrine has Originated—These may be Explained by Supposing a Uniform and Uninterrupted Series of Changes—Threefold Consideration of this Subject: First, in Reference to the Laws which Govern the Formation of Fossiliferous Strata, and the Shifting of the Areas of Sedimentary Deposition; Secondly, in Reference to the Living Creation, Extinction of Species, and Origin of New Animals and Plants; Thirdly, in Reference to the Changes Produced in the Earth’s Crust by the Continuance of Subterranean Movements in Certain Areas, and their Transference after Long Periods to New Areas—On the Combined Influence of all these Modes and Causes of Change in Producing Breaks and Chasms in the Chain of Records—Concluding Remarks on the Identity of the Ancient and Present System of Terrestrial Changes. ORIGIN of the doctrine of alternate periods of repose and disorder.—It has been truly observed, that when we arrange the fossiliferous formations in chronological order, they constitute a broken and defective series of monuments: we pass without any intermediate gradations from systems of strata which are horizontal, to other systems which are highly inclined—from rocks of peculiar mineral composition to others which have a character wholly distinct—from one assemblage of organic remains to another, in which frequently nearly all the species, and a large part of the genera, are different. These violations of continuity are so common as to constitute in most regions the rule rather than the exception, and they have been considered by many geologists as conclusive in favour of sudden revolutions in the inanimate and animate world. We have already seen that according to the speculations of some writers, there have been in the past history of the planet alternate periods of tranquillity and convulsion, the former enduring for ages, and resembling the state of things now experienced by man; the other brief, transient, and paroxysmal, giving rise to new mountains, seas, and valleys, annihilating one set of organic beings, and ushering in the creation of another. It will be the object of the present chapter to demonstrate that these theoretical views are not borne out by a fair interpretation of geological monuments. It is true that in the solid framework of the globe we have a chronological chain of natural records, many links of which are wanting: but a careful consideration of all the phenomena leads to the opinion that the series was originally defective—that it has been rendered still more so by time—that a great part of what remains is inaccessible to man, and even of that fraction which is accessible nine-tenths or more are to this day unexplored. The readiest way, perhaps, of persuading the reader that we may dispense with great and sudden revolutions in the geological order of events is by showing him how a regular and uninterrupted series of changes in the animate and inanimate world must give rise to such breaks in the sequence, and such unconformability of stratified rocks, as are usually thought to imply convulsions and catastrophes. It is scarcely necessary to state that the order of events thus assumed to occur, for the sake of illustration, should be in harmony with all the conclusions legitimately drawn by geologists from the structure of the earth, and must be equally in accordance with the changes observed by man to be now going on in the living as well as in the inorganic creation. It may be necessary in the present state of science to supply some part of the assumed course of nature hypothetically; but if so, this must be done without any violation of probability, and always consistently with the analogy of what is known both of the past and present economy of our system. Although the discussion of so comprehensive a subject must carry the beginner far beyond his depth, it will also, it is hoped, stimulate his curiosity, and prepare him to read some elementary treatises on geology with advantage, and teach him the bearing on that science of the changes now in progress on the earth. At the same time it may enable him the better to understand the intimate connection between the Second and Third Books of this work, one of which is occupied with the changes of the inorganic, the latter with those of the organic creation. In pursuance, then, of the plan above proposed, I will consider in this chapter, first, the laws which regulate the denudation of strata and the deposition of sediment; secondly, those which govern the fluctuation in the animate world; and thirdly, the mode in which subterranean movements affect the earth’s crust. Uniformity of change considered, first, in reference to denudation and sedimentary deposition.—First, in regard to the laws governing the deposition of new strata. If we survey the surface of the globe, we immediately perceive that it is divisible into areas of deposition and non-deposition; or, in other words, at any given time there are spaces which are the recipients, others which are not the recipients, of sedimentary matter. No new strata, for example, are thrown down on dry land, which remains the same from year to year; whereas, in many parts of the bottom of seas and lakes, mud, sand, and pebbles are annually spread out by rivers and currents. There are also great masses of limestone growing in some seas, chiefly composed of corals and shells, or, as in the depths of the Atlantic, of chalky mud made up of foraminifera and diatomaceæ. As to the dry land, so far from being the receptacle of fresh accessions of matter, it is exposed almost everywhere to waste away. Forests may be as dense and lofty as those of Brazil, and may swarm with quadrupeds, birds, and insects, yet at the end of thousands of years one layer of black mould a few inches thick may be the sole representative of those myriads of trees, leaves, flowers, and fruits, those innumerable bones and skeletons of birds, quadrupeds, and reptiles, which tenanted the fertile region. Should this land be at length submerged, the waves of the sea may wash away in a few hours the scanty covering of mould, and it may merely impart a darker shade of colour to the next stratum of marl, sand, or other matter newly thrown down. So also at the bottom of the ocean where no sediment is accumulating, seaweed, zoophytes, fish, and even shells, may multiply for ages and decompose, leaving no vestige of their form or substance behind. Their decay, in water, although more slow, is as certain and eventually as complete as in the open air. Nor can they be perpetuated for indefinite periods in a fossil state, unless imbedded in some matrix which is impervious to water, or which at least does not allow a free percolation of that fluid, impregnated, as it usually is, with a slight quantity of carbonic or other acid. Such a free percolation may be prevented either by the mineral nature of the matrix itself, or by the superposition of an impermeable stratum; but if unimpeded, the fossil shell or bone will be dissolved and removed, particle after particle, and thus entirely effaced, unless petrifaction or the substitution of some mineral for the organic matter happen to take place. That there has been land as well as sea at all former geological periods, we know from the fact that fossil trees and terrestrial plants are imbedded in rocks of every age, except those which are so ancient as to be very imperfectly known to us. Occasionally lacustrine and fluviatile shells, or the bones of amphibious or land reptiles, point to the same conclusion. The existence of dry land at all periods of the past implies, as before mentioned, the partial deposition of sediment, or its limitation to certain areas; and the next point to which I shall call the reader’s attention is the shifting of these areas from one region to another. First, then, variations in the site of sedimentary deposition are brought about independently of subterranean movements. There is always a slight change from year to year, or from century to century. The sediment of the Rhone, for example, thrown into the Lake of Geneva, is now conveyed to a spot a mile and a half distant from that where it accumulated in the tenth century, and six miles from the point where the delta began originally to form. We may look forward to the period when this lake will be filled up, and then the distribution of the transported matter will be suddenly altered, for the mud and sand brought down from the Alps will thenceforth, instead of being deposited near Geneva, be carried nearly 200 miles southwards, where the Rhone enters the Mediterranean. In the deltas of large rivers, such as those of the Ganges and Indus, the mud is first carried down for many centuries through one arm, and on this being stopped up it is discharged by another, and may then enter the sea at a point 50 or 100 miles distant from its first receptacle. The direction of marine currents is also liable to be changed by various accidents, as by the heaping up of new sandbanks, or the wearing away of cliffs and promontories. But, secondly, all these causes of fluctuation in the sedimentary areas are entirely subordinate to those great upward or downward movements of land, which will presently be spoken of, as prevailing over large tracts of the globe. By such elevation or subsidence certain spaces are gradually submerged, or made gradually to emerge: in the one case sedimentary deposition may be suddenly renewed after having been suspended for one or more geological periods, in the other as suddenly made to cease after having continued for ages. If deposition be renewed after a long interval, the new strata will usually differ greatly from the sedimentary rocks previously formed in the same place, and especially if the older rocks have suffered derangement, which implies a change in the physical geography of the district since the previous conveyance of sediment to the same spot. It may happen, however, that, even where the two groups, the superior and the inferior, are horizontal and conformable to each other, they may still differ entirely in mineral character, because, since the origin of the older formation, the geography of some distant country has been altered. In that country rocks before concealed may have become exposed by denudation; volcanos may have burst out and covered the surface with scoriæ and lava; or new lakes, intercepting the sediment previously conveyed from the upper country, may have been formed by subsidence; and other fluctuations may have occurred, by which the materials brought down from thence by rivers to the sea have acquired a distinct mineral character. It is well known that the stream of the Mississippi is charged with sediment of a different colour from that of the Arkansas and Red Rivers, which are tinged with red mud, derived from rocks of porphyry and red gypseous clays in ‘the far west.’ The waters of the Uruguay, says Darwin, draining a granitic country, are clear and black, those of the Parana, red. 1 The mud with which the Indus is loaded, says Burnes, is of a clayey hue, that of the Chenab, on the other hand, is reddish, that of the Sutlej is more pale. 2 The same causes which make these several rivers, sometimes situated at no great distance the one from the other, to differ greatly in the character of their sediment, will make the waters draining the same country at different epochs, especially before and after great revolutions in physical geography, to be entirely dissimilar. It is scarcely necessary to add that marine currents will be affected in an analogous manner in consequence of the formation of new shoals, the emergence of new islands, the subsidence of others, the gradual waste of neighbouring coasts, the growth of new deltas, the increase of coral reefs, volcanic eruptions, and other changes. Uniformity of change considered, secondly, in reference to the living creation.—Secondly, in regard to the vicissitudes of the living creation, all are agreed that the successive groups of sedimentary strata found in the earth’s crust are not only dissimilar in mineral composition for reasons above alluded to, but are likewise distinguishable from each other by their organic remains. The general inference drawn from the study and comparison of the various groups, arranged in chronological order, is this: that at successive periods distinct tribes of animals and plants have inhabited the land and waters, and that the organic types of the newer formations are more analogous to species now existing than those of more ancient rocks. If we then turn to the present state of the animate creation, and enquire whether it has now become fixed and stationary, we discover that, on the contrary, it is in a state of continual flux—that there are many causes in action which tend to the extinction of species, and which are conclusive against the doctrine of their unlimited durability. There are also causes which give rise to new varieties and races in plants and animals, and new forms are continually supplanting others which had endured for ages. But natural history has been successfully cultivated for so short a period, that a few examples only of local, and perhaps but one or two of absolute, extirpation of species can as yet be proved, and these only where the interference of man has been conspicuous. It will nevertheless appear evident, from the facts and arguments detailed in the chapters which treat of the geographical distribution of species in the next volume, that man is not the only exterminating agent; and that, independently of his intervention, the annihilation of species is promoted by the multiplication and gradual diffusion of every animal or plant. It will also appear that every alteration in the physical geography and climate of the globe cannot fail to have the same tendency. If we proceed still farther, and enquire whether new species are substituted from time to time for those which die out, we find that the successive introduction of new forms appears to have been a constant part of the economy of the terrestrial system, and if we have no direct proof of the fact it is because the changes take place so slowly as not to come within the period of exact scientific observation. To enable the reader to appreciate the gradual manner in which a passage may have taken place from an extinct fauna to that now living, I shall say a few words on the fossils of successive Tertiary periods. When we trace the series of formations from the more ancient to the more modern, it is in these Tertiary deposits that we first meet with assemblages of organic remains having a near analogy to the fauna of certain parts of the globe in our own time. In the Eocene, or oldest subdivisions, some few of the testacea belong to existing species, although almost all of them, and apparently all the associated vertebrata, are now extinct. These Eocene strata are succeeded by a great number of more modern deposits, which depart gradually in the character of their fossils from the Eocene type, and approach more and more to that of the living creation. In the present state of science, it is chiefly by the aid of shells that we are enabled to arrive at these results, for of all classes the testacea are the most generally diffused in a fossil state, and may be called the medals principally employed by nature in recording the chronology of past events. In the Upper Miocene rocks (No. 5 of the table, p. 135) we begin to find a considerable number, although still a minority, of recent species, intermixed with some fossils common to the preceding, or Eocene, epoch. We then arrive at the Pliocene strata, in which species now contemporary with man begin to preponderate, and in the newest of which nine-tenths of the fossils agree with species still inhabiting the neighbouring sea. It is in the Post-Tertiary strata, where all the shells agree with species now living, that we have discovered the first or earliest known remains of man associated with the bones of quadrupeds, some of which are of extinct species. Note 1. Darwin’s Journal, p. 163, 2nd edit., p. 139. Note 2. Journ. Roy. Geograph. Soc., vol. iii., p. 142.